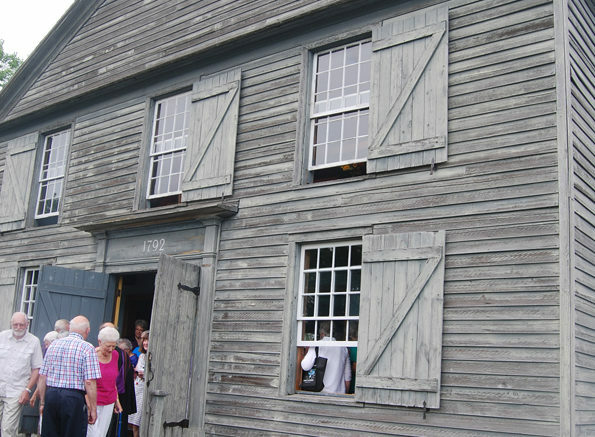 The clapboard siding and window frames on the Old Hay Bay Church will be a priority as trustees raise money for restoration work at the historic Methodist meeting house, built in 1792. Canada’s oldest surviving Methodist church outside the Maritimes is in need of an ambitious restoration project and its trustees are preparing to rally community support to finance the work. Elaine Farley, the chair of the Old Hay Bay Church restoration committee, says weathering and wear-and-tear has made it necessary to invest in the continued longevity of the 225-year-old house of worship. The clapboard siding was last replaced in the 1970s. Farley said she believes a restoration is something that can last the test of time, particularly since there are now better stains and technologies for protecting the wood against the elements. To complete the project, a major fundraising campaign will be required, but the committee isn’t completely working from scratch. Through trustees, volunteer custodians, local organizations, and others already connected to the church, some $30,000 has already been raised. That commitment is a form of leverage. “We have shown we are committed. It’s time to move forward to bring the community on board to support us,” Farley said. On Feb. 21, the church’s trustees will announce their fundraising plans at an invitation-only event at the L&A County Museum. Farley said one of the contractors quoting on the job has taken an extensive number of photos that will be shown to illustrate the need. At that meeting, there will be discussion about the various phases of work planned. After the exterior work, the trustees are planning to do painting and plaster work inside the church, then move on to improve the custodians’ cottage, cemetery, and grounds. Through the overall campaign, trustees hope to collect $300,000. Farley indicated she believes protecting the church is important not just for its faith history, but its connection to the region’s United Empire Loyalist roots. “It’s a great reflection of the commitment of the United Empire Loyalists who came here and pulled together as a community,” she said. “When you look at the 22 original subscribers, they came from all walks of life. They were not all Methodists to begin with. Some were German, some British. Some were what we now call professional people and some were farmers. She added trustees are also hoping attention for the capital campaign will help local people rediscover the site. Last year, about 2,000 people visited the church. Farley said that was down a bit from other years, mainly due to the wet weather and high waters. The conditions left the Adolphustown-to-Glenora ferry link out of service for some time and, typically, the church has been an attraction for tourists visiting Prince Edward County. Traditionally, the historic church on Hay Bay’s south shore has been open to the public from the May long weekend through to late September with volunteer custodians on site to serve as interpreters. It has also become a venue for weddings and other special events in recent years. Those wishing to support the campaign can visit www.oldhaybaychurch.ca for details.